It's been a while since we've seen a new organic carrier from BabyBjörn. Now fans of this popular brand have one more organic baby carrier to choose from - the new Organic Baby Carrier Miracle. 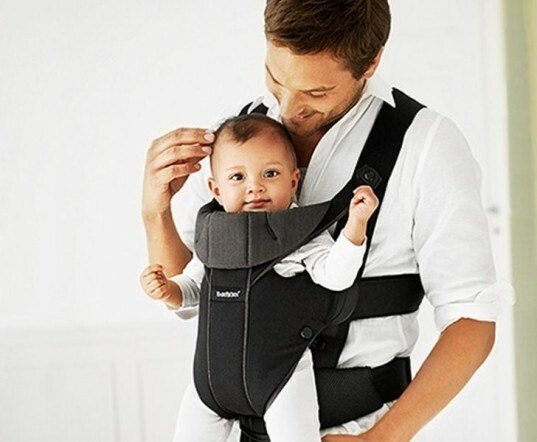 The new Baby Carrier Miracle, which also comes in a conventional soft cotton and an airy mesh, is a great choice for parents who want to carry their little one in superior comfort in a variety of ways for longer periods of time than previous BabyBjörn models allowed. Read on to see all the great features of the new Organic Baby Carrier Miracle. The new Baby Carrier Miracle was two years in the making and works with the needs of not only newborn babies, but older babies as well. BabyBjörn wanted to design a carrier that provides proper support for the head and neck of the smallest babies, including an upright body position to ensure the free passage of air, as well as the correct position for the child’s legs. They also concluded that young babies are best carried tummy against tummy. User tests showed that when children begin walking on their own, they no longer want to be carried in a baby carrier – usually when a child is around 15 months and about 26 lbs (the upper limit and maximum weight of the new carrier). BabyBjörn conducted many tests with parents and babies to see what would make carrying older babies more comfortable but found out that parent opinions varied, thus the new carrier is designed to be flexible and adjustable in several ways. The new Baby Carrier Miracle was developed in cooperation with pediatricians and is anatomically adjustable to fit your growing child. The carrier is made from soft, organically grown cotton and has non-chafing seams. Baby Carrier Miracle is designed to fit your newborn perfectly from day one, without any extra inserts, insets or pillows and works well for newborn babies right through to approximately 15 months. The new Baby Carrier Miracle comes with an entirely new and unique design that features a generously padded adjustable waist belt, comfortable back support and wide shoulder straps that allow for flexible carrying in a variety of ways. Parents of varying sizes can make easy adjustments from the front plus transfer baby’s weight between the waist, hips and shoulders as needed. The new design means you can place more weight on either your shoulders or waste and hips, depending on what works best for you. You can also adjust the carrier to wear your baby higher or lower. Newborns and young babies are carried very differently than older babies, an issue that Baby Carrier Miracle addresses. There’s a well-designed head support in place that plays a vital role in providing support for the newborn baby’s neck. The head support is totally adjustable, and can be folded down once your baby can hold his or her head up and be carried facing forwards. Being able to carry your child facing you, in an upright position, allows you to maintain eye contact and supervise your baby’s breathing. Plus, the upright position allows for better free passage of air. When your baby’s neck muscles have grown strong enough you can turn the Baby Carrier Miracle around and let your little one see his world, thus encouraging interactions while still letting your little’s one’s back rest safely against your chest. Baby Carrier Miracle was made to be ultra comfortable, cozy and safe. The seams on this BabyBjorn have been placed on the outside, so they won’t chafe baby’s arms and legs. The soft organic fabric on the inside of the baby carrier is extra smooth and gentle on sensitive skin. Each and every material used in this organic carrier are tested and guaranteed free from harmful substances, and comply with the requirements of the Oeko-Tex Standard 100, class 1 for baby products. The new Baby Carrier Miracle was two years in the making and works with the needs of not only newborn babies, but older babies as well. BabyBjörn wanted to design a carrier that provides proper support for the head and neck of the smallest babies, including an upright body position to ensure the free passage of air, as well as the correct position for the child’s legs. They also concluded that young babies are best carried tummy against tummy. User tests showed that when children begin walking on their own, they no longer want to be carried in a baby carrier - usually when a child is around 15 months and about 26 lbs (the upper limit and maximum weight of the new carrier). BabyBjörn conducted many tests with parents and babies to see what would make carrying older babies more comfortable but found out that parent opinions varied, thus the new carrier is designed to be flexible and adjustable in several ways. Newborns and young babies are carried very differently than older babies, an issue that Baby Carrier Miracle addresses. There's a well-designed head support in place that plays a vital role in providing support for the newborn baby’s neck. The head support is totally adjustable, and can be folded down once your baby can hold his or her head up and be carried facing forwards. Being able to carry your child facing you, in an upright position, allows you to maintain eye contact and supervise your baby's breathing. Plus, the upright position allows for better free passage of air. When your baby’s neck muscles have grown strong enough you can turn the Baby Carrier Miracle around and let your little one see his world, thus encouraging interactions while still letting your little's one’s back rest safely against your chest. Baby Carrier Miracle was made to be ultra comfortable, cozy and safe. The seams on Baby Carrier Miracle have been placed on the outside, so they won’t chafe baby’s arms and legs. The soft organic fabric on the inside of the baby carrier is extra smooth and gentle on sensitive skin. Each and every material used in this organic carrier are tested and guaranteed free from harmful substances, and comply with the requirements of the Oeko-Tex Standard 100, class 1 for baby products.